And yet there's something in He-Man that transcends criticism. Despite the show's crass badness, I enjoyed rewatching it on many levels. The deep magical connection I felt as a child was still there, and the show was also a powerful shot of a cultural innocence that doesn't seem to exist anymore. As I watched, He-Man kept reminding me—in temperament, bearing, and even tone of voice—of Ronald Reagan, and of the cheerful, rule-bound pop-cultural naiveté that seemed to reach its term limit around the same time as the Gipper. In the era of South Park, Adult Swim, and TV Funhouse (whose "Ambiguously Gay Duo" picks up on the sexual comedy of He-Man perfectly), cartoons have become carriers of adult attitudes and ideas. Even today's kids' programming is self-conscious and ironic. 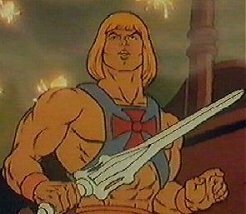 SpongeBob would have mocked He-Man until he cried. It's a very long way from here to Eternia. Cartoons are geared more towards adults today anyway...you have to figure, if you get kids watching cartoons with their parents, and the parents enjoy themselves, the companies producing the cartoons are going to profit. I always thought Skeletor needed to be more of a badass in that cartoon. That cartoon, and Voltron, were huge disappointments to me. Blasphemy! The underlying sexual tension between the the guy who flew the Black Lion and the Princess in the Blue Lion was one of the big reasons I tuned into Voltron. But this guy does pick p on something I noticed when I bought a Transformers DVD. These cartoon are nowhere near as good as we remember them being.